All transactions are safe and secure with a reliable history in online purchasing behind each of our associates. 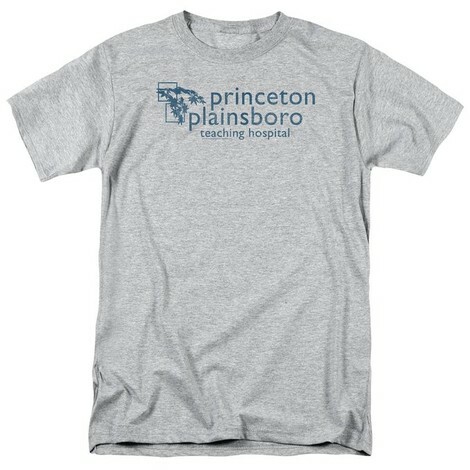 Buy the Property of Princeton Plainsboro Teaching Hospital t-shirt to own House clothing and merchandise. Utilizing a combination of medical knowledge and psychology, Gregory House M.D. and his team of doctors work out of the Princeton-Plainsboro Teaching Hospital. The hospital's exterior shots are actually of Princeton University's First Campus Center, the University's student center. In addition to the Property of Princeton Plainsboro Teaching Hospital tee above, browse the House Clothing Gallery for more apparel like men's and women's clothes, kids shirts or hoodies.